It has a natural cathedral located at the first chamber, which was turned into a chapel by the local people. The conditions inside the cave cause stalactites and stalagmites, particularly in the deeper chambers. Every chamber has natural crevices, which let light get into the cave, serving as illumination for the otherwise dark areas of the place. How to go? 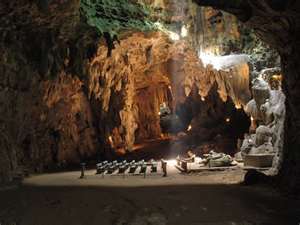 It is only half an hour drive from Cagayan’s capital Tuguegarao City, it is one of the province’s most popular caves. It was named after the Kallaw bird, once very common in this area, but because of hunting it is now very rare. The cave is located above the Pinacanauan River. 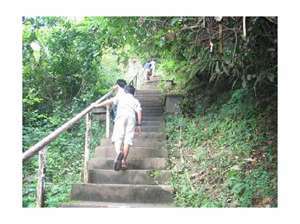 A stair leads up 187 steps on the mountainside to the cave entrance. A series of seven chambers may be visited. The first huge chamber is called the Aviary Room, having many openings which let in daylight and several species of birds who live here. The site of archaeologic excavations right at the entrance is fenced off. Archaeologists from the University of the Philippines found Neolithic tools and human remains. The main attraction of the cave is the second chamber called Divine Room. It was transformed into a church, because it is spacious and has an opening allowing the sunlight to enter the huge chamber. There are benches and an altar. The locals jest that it is possible to have a wedding in this church, but only if the groom carries the bride all the way up the 187 steps. The following chamber has no opening and is thus dark, logically it is called Dark Room. Form here a good torchs seems appropriate. The Cream Room was named after a large formation which looks like three scoops of ice-cream. It follows the Jungle Area, named after several animal-shaped rock formations. The sixth room has a passage branching off halfway up the ceiling. It is accessible on spelunking tours, but the participants enter the passage on the far end on the otehr side of the mountain. The final chamber is called Sun Room, because early in the morning, between 8 and 10, sun rays shile through an opening in the wall. Later the angle changes and the sun does not directly hit the cave any more.